I’d pulled together a small focus group of educators (one historian, one business studies, one IT) and wanted them to hear some proposals for the inclusion of digital technologies in the classroom – I had some ideas for using some freely available tools that both the teachers and pupils could benefit from using and I wanted to see what the early reaction would be, and to see if the idea was was likely to be picked up, or would wither on the vine. I pictured for them an imaginary school – a school which had recently expanded and built a new science block. An archaeological team was called in to assess the ground before construction had begun and the post holes and foundations of a Medieval Hall had been excavated. They then conducted a wider geophysical survey across the rest of the sports field and lo and behold – there was a previously unknown Medieval village there too – the layout of the streets, houses, forge, the lot. The school was excited, and, being a progressive kind of place, they commissioned an artist to create a paint-and-canvas interpretation of how it might have looked, and also had the excavation plan blown up, laminated, and stuck on a wall. For the next stage I played them a video I had put together earlier in the day, explaining various points as they played out across the screen. It began with an image of the Deserted Medieval Village (DMV from here on in) plan. We zoomed out a little to reveal that the plan was an overlay in Google Earth, placed and scaled exactly, so it occupied the same area as the original excavation, and, of course, the original Medieval village. Next, the plan and topography were imported to Sketchup and we whizzed through the reconstruction of a village. I’d actually just downloaded a handful of pre-built Medieval looking houses from the Google 3D warehouse, rescaled them, and planted them over areas which matched their footprint (more or less) – this was an experiment, after all – I didn’t need to spend a fortnight building a perfect village. Once that was done, the village was uploaded back into Google Earth, and various slow rotation/zooming camera work impressed upon them that this was a good thing. So. What exactly was it I was demonstrating? Well at that point in the pitch I was demonstrating that impressive digital reconstructions could be had for zero expenditure in cash, but a little investment in learning time. They all agreed that it looked good – that there were some interesting ideas in there which could be passed onto the kids, but the general feeling was that the expenditure of time and energy put into learning how to reconstruct a DMV didn’t really have a pay off. The IT guy could see how it would be a good way to get them interested in a project which involved CAD programs, and the history teacher thought it would be a good way to explore the Medieval through having his kids work out what building materials would be needed and what was available at the time. The business teacher thought it looked pretty good, but wasn’t really sure how it could be applied to what she taught. So we’re now going to head into the realms of fiction, but using only modifications of digital technology available today. It’s only fiction in that all the ideas have yet to be assembled in one place – they already exist in other systems, though many of the working examples of interactions and in game systems are based on the World of Warcraft model (you can play for free up to level 20 if you want a direct experience). I won’t go into the background in too much detail – a group of wikipedians have already done a sterling job here – but the basic premise is as follows (seasoned WoWers can skip to the next bold heading); You start by creating a character for yourself – early decisions consist of what race you’re going to be (human, elf and so-on) and then what class they’re going to be (hunter, warrior and so-on). These are fairly important decisions, because unlike other attributes you attach to your character later, these remain constant – you can’t change your mind. Then according to whichever race you chose, you get set down in a faux Medieval world with nothing much but some very basic clothes and not much skill in your chosen class. The aim of the game is to level up so you can better equip yourself to deal with the immediate environment, and the best way to do that is to upgrade your ability to protect yourself from damage, and improve your ability to attack. Though when you strip it down to this level it all sounds a little aggressive and pointless, it may help the keep in mind that our own biological imperative – to survive long enough to reproduce – also sounds somewhat lacking in depth. I like to think that it’s how we go about achieving these goals that provides the interesting, fun and worthwhile side of the equation. So, just a little more about WoW before we get to the point. Your progression through the world is driven by a quest system – in game characters give you quests, the point of which is to drive you further into the game, while providing you with enough rewards and levelling points to ensure that you don’t get out of your depth too quickly. Following these quests will lead to you being introduced to a series of settlements, each significantly larger and more socially complex than the last. A village may contain a blacksmith and an inn (armour and a safe haven), and a town will contain these facilities as well as class trainers,shops and traders and so-on. A city will contain all these things plus banks, ports, and an auction house. And the auction house is where it gets really interesting, because the auction houses in WoW are powered by the same fundamental principles of supply and demand that power the real world stock markets. That power, more importantly, the real world markets that occur in real world market squares. Because regardless of whether you’re trading exotic seahorse mounts, enchanted two-handed axes or coffee beans, the underlying principles of exchange are identical, and therefore the skills are transferable. Now, people who know me in the flesh might be astonished that I find the stock market interesting, and I’d like to assure them that I haven’t suddenly become a rabid capitalist. My interest here is in the model of a stock market, and what differences it makes to a game. Because the difference it makes is the introduction of of collaborations and power shifts which occur in a safe environment. This transforms WoW from a smash and bash fantasy game, to an astoundingly useful sandbox in which social experiments can be performed safely (but more of that later). For the moment let’s have a look at. . . The big idea was to provide schools and colleges access to servers on which digital worlds resided. But instead of a fantasy world, these digital globes would be modelled using real-world topographical information – much like Google Earth. This is a truly massive subject, so we’ll start small and return to the example of the fictional school and its accompanying Deserted Medieval Village. Initially the real world applications might not be obvious, but if you’re got the patience to run through to the end, they will start to emerge. Before they start the students will have to do a little research into Medieval structures, and how many of each type of building their settlement would be need. Then they set about building them in a CAD, or an in-game editor (CryEngine, Unreal, Unity and so-on). The libraries of textures and shapes generated during the building phase could be dumped in a warehouse (like the Google Warehouse), so anyone following on wouldn’t have to start from scratch. Building design would be constrained by material availability, just as it was in the Medieval – window size being dependent on the glass technology of the time, for instance. Anyway. You’ve built the village. It looks pretty good, but it’s actually no going to provide you with much more meaningful data than the paint and canvas reconstruction the artist did for you. So how can you generate meaningful data, and how are your students now going to benefit from their labours? You populate your village. Not with Sims dolls, but with your students. In the build phase your students would have to be generalists, but in the population phase specialists will emerge, along with specialist research. One of them, for instance, spots the fact that a mill would be handy, both in terms of what they could offer the village, but also in terms of making themselves strategically significant. But before they can make that idea a reality, they are going to have to study the local geography to see whether a watermill or a windmill would be the best option, and of course research mill designs. They may also have to collaborate – to form a collective – who are willing to donate labour and materials to the project. Anyway – you get the idea. To begin with it would probably be simplest to have more of a building bock approach, and when the system starts getting populated, then then finer gradations of the division of labour could kick in. Farmville – you may remember it -started as a game in Facebook, had over 80 million players at one point. I can see how the simplified, speeded up, world of farming could be folded into the digital world I’m describing. People could go off, build a farmstead, supply the local market with foodstuffs. Obviously other people would have to run the markets and so-on, but as long as there was a currency in place then a reward system could be devised to keep essential materials flowing. But now we’ll ramp it up. Another class/school has a different village on the same worldserver. They haven’t had the idea of building a mill but they need their wheat turning into flour, so deals are done and networks of common interest emerge. As more people sign up, so the population increases, and so the levels of social complexity increase. Other systems will emerge to cope with the increase. Where previously a handful of farmers, smiths and market traders trundled on together, hierarchies within settlements will form. Guilds, if you will. More networks. Materials and labour for roads will be needed. To begin with, a period of relative calm should probably be observed so various systems can develop. Then, perhaps, chaotic elements could be introduced. An extended dry spell so the crops fail and your character faces the prospect of starvation. What will happen then? What networks will come into play? Perhaps ploughshares will be turned into swords to ensure your survival. And if you get through it, then you’ve just made the leap towards having to maintain a standing army. So where are you going to find the extra metals for the armour and weapons they need? The firewood for the forges? You don’t want to crash your natural resources, otherwise you’re finished anyway. Oh, unless you can go and grab someone else’s before they get too much bigger? Hang on, did anyone else survive? They did? How big is their army? Fine – so people have a military. Borders are defined, and the farmers go back to farming while the patrols keep feeding information about other patrols back to the leader/council. And who are they? Were they elected? Or were they just the best people to ensure survival through a period of conflict? Other systems/other networks emerging. So things have settled down a little. We’ve gone from farming to hierarchies via conflict. It’s probably not the only way it happens, but that’s how it happened this time. So what happens when someone washes up on some nearby digital shore carrying a plague? You can’t fight that off with swords. A plague doesn’t give a damn how big the top guys hat is – if he breathes in at the wrong moment he’s as dead as the next man/woman. This is where you find you weren’t as smart as you thought you were as a society. Medicine would probably be a good next move. 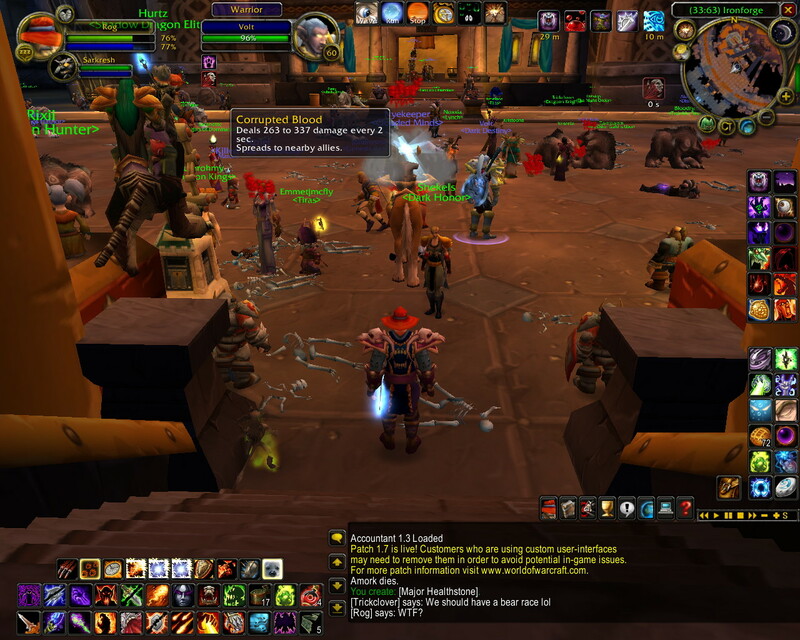 The Corrupted Blood debuff being spread amongst characters in Ironforge, one of World of Warcraft′s in-game cities. © Blizzard Entertainment. Your students prepare themselves for various roles in the real world by sandboxing entire existences and social systems in a digital world which, though it may occasionally piss you off by killing you, has no sharp edges as such. You can teach them about economics while they’re practising economics. You can teach them the principles of business and let them run their own scenarios. You don’t have to teach them the value of a trade, they know all about it. Digital worlds have been overflowing into the material world for quite some time. Back in 2006 a chap called Stephen Gillett applied for a position as a senior manager in engineering at Yahoo. He had the usual collection of qualifications that allowed him to gain a strong position in the interview process, but as the conversation flowed it emerged that he was a master in one of the top guilds of World of Warcraft. One of his interviewer played the game, was aware of the guild and its reputation, and was impressed by the fact that all the qualities you needed to successfully run a thriving WoW guild – networking, organisation, mitigation and focused group activities were precisely the same qualities that they desired for the position at the company. He was offered the job and took it – but the point is this – all the interviewees, to a greater or lesser extent, would probably have been capable of doing the job, and it was a matter of luck that his position as a guild master in WoW came up, however it was this that tipped the balance in his favour. Secondly there is a small matter of leverage to be considered, a you scratch my back and I’ll scratch yours element. Certainly Mr. Gillett wanted the position at Yahoo. But how much did the interviewer desire a position in the guild that Gillett ran? Another example from the World of Warcraft is the Corrupted Blood Incident. This was borne from a simple but highly infectious debuff that briefly drained your high level character’s health and was, by all accounts, a relatively mild attack that was supposed to be confined to a particular area. However through a glitch, the players pets and minions became infected and carried the outbreak into the wider world and, more importantly, into areas inhabited by lower level players for whom the infection was fatal. The debuff spread like a plague and create a great deal of disruption, panic, and general running away from major centres of population – the programmers attempted to enforce quarantines, but the infection was only curtailed through a series of patches and took around a week to control. The way it was transmitted, and the reactions of the players, so mirrored the way a real disease spreads that a group of scientists at various research centres used it as a model for research. One researcher – a Tufts University professor named Nina Fefferman – was so taken with the parallels between digital and material worlds that she grew keen on the idea of creating and introducing new diseases specifically for the purpose of studying not only the infections were spread, but the reactions of the players to the event – something which had previously been lacking in pure number simulations. The following year, Blizzard, the maker of the game, introduced a zombie plague as part of the publicity for the launch of the Wrath of the Lich King expansion. It’s unknown if this was part of such an experimental digital disease program as suggested by Fefferman, a complete coincidence, or simply that the one event inspired the other and Fefferman had no influence on the decision at all. It would be extremely interesting to find out. As broadband and cheap processing power becomes more ubiquitous, and more and more games follow the free to play model, and are disseminated through popular networks such as Steam, the flow of experience from digital worlds to the material word is only going to get stronger and stronger, and I’ll be revisiting this subject again in the not too distant future. In the meantime, if you’re a parent and your children want to play – let them. You’re doing them a favour. One day they may well thank you for it. Digital worlds are already overflowing into the material world (see ‘You Play World of Warcraft? You’re Hired!‘) are beginning to visibly influence medical studies (see The Corrupted Blood Incident – another World of Warcraft example), and the flow is only going to get stronger. In the meantime, if your kid wants to play – let them. You’re doing them a favour. PS – this has not turned into the neat flow of ideas and proposals I had in mind when I started writing it, so the good/bad news is that it is now the first of a series of posts about digital worlds, in which I’ll try and concentrate a bit more and cover smaller topics which, hopefully, will coalesce into something which has a functioning rudder. Here’s hoping.